AFP — Outspoken ski star Bode Miller blasted the Olympic downhill course as “treacherous” Saturday after seeing a teammate narrowly avoid serious injury as US snowboarder Sage Kotsenburg claimed the first gold of the Games. Kotsenburg won the men’s slopestyle snowboarding competition and shortly afterwards Marit Bjoergen became Norway’s most successful female Olympian by taking the cross-country skiathlon. 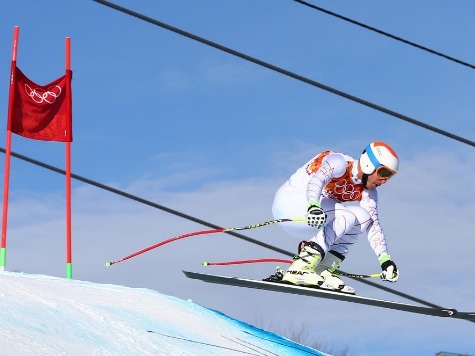 Ski veteran Miller, who won gold, silver and bronze at the 2010 Vancouver Olympics, was fastest in training for Sunday’s medal race up in Rosa Khutor. But he left no-one in any doubt as to his thoughts on the course, delivered in his usual forthright manner. Kotsenburg, who only just squeezed into Saturday’s final, claimed the inaugural slopestyle title on a course that has also witnessed a series of spectacular falls and bone-crunching injuries. His first run scored 93.50 and although some of his rivals put in high scores on their second runs, the 20-year-old from Utah held on for victory. Norway’s Staale Sandbech (91.75) claimed silver while Mark McMorris of Canada took bronze with 88.75. Norway’s cross-country skiing superstar Bjoergen claimed her fourth career gold to become her country’s most successful female Olympian, surpassing legendary figure skater Sonja Henie. Under stunning blue skies at the Laura cross-country ski centre, Bjoergen won the combined 7.5km classic style/7.5km freestyle event. Sweden’s Charlotte Kalla was second with Heidi Weng of Norway taking the bronze. Bjoergen, 33, won three golds in Vancouver four years ago. Later Saturday, Norway may be celebrating again when biathlete Ole Einar Bjoerndalen looks to win a 12th medal and equal the record of Bjorn Daehlie, the all-time most decorated winter Olympian. The man known as “The Cannibal” is 40 but his enthusiasm for the sport, which incorporates cross-country skiing and shooting, burns as brightly as ever in what will be his sixth Olympics. Among his huge collection of Olympic medals he has six gold, as well as 19 world championship titles. History will definitely be made when the first training runs in women’s ski jumping take place. Japan’s 17-year-old Sara Takanashi, the runaway World Cup leader, is the overwhelming favourite to take gold in the inaugural event. The day’s last two medals will be in men’s 5,000m speedskating, where defending champion Sven Kramer of the Netherlands aims to become the second male skater to win the event in successive Games after Tomas Gustafson of Sweden in 1984 and 1988. In freestyle skiing, American defending champion Hannah Kearney is favourite to retain her women’s moguls crown. Number-one ranked Kearney is the 2005 and 2013 world champion.